In Geneva, this past January, Van Cleef & Arpels launched a new Poetic Complication timepiece for women, the Lady Arpels Ballerine Enchantée. 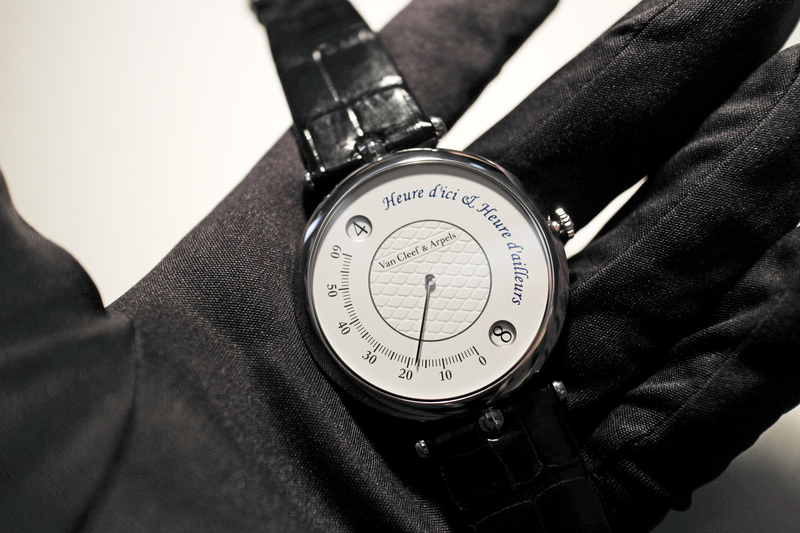 The dial features a ballerina, whose tutu, is actually a retrograde time indicator. Due to the massive amount of energy required to power the display, time is only available on demand. Meaning, you have to push a button at 8 o’clock to actually read the time. Once pressed the veil on the left rises to the current hour and the veil on the right rises to the current minute. Then, after holding in position, both veils fall simultaneously to their original starting position. 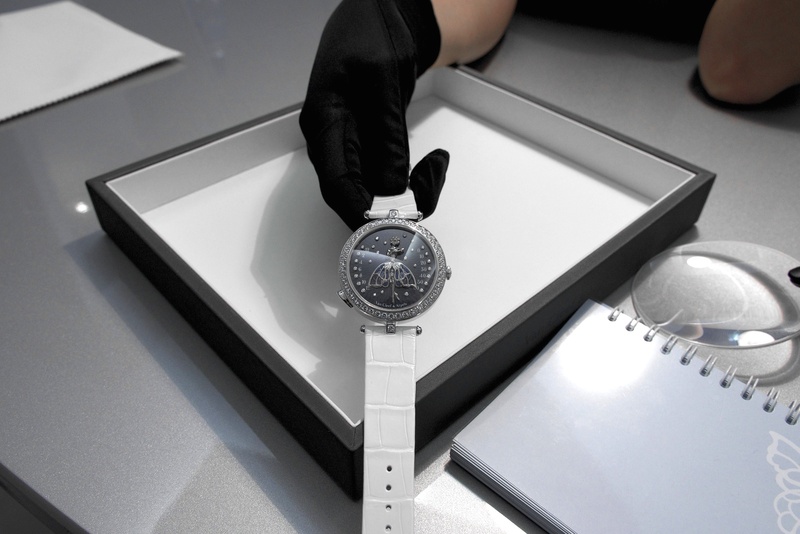 The case is 40.5 mm and is in white gold set with diamonds. The dial features a guilloché background with a purple translucent and champlevé enamel. “A true miniature figurine, the golden ballerina is sculpted in relief and set with diamonds, emphasizing her waist and face. The layered veils of her tutu, light and transparent, create the magic of the piece. While an inner corolla of champlevé enamel clothes the dancer, the outer veils – like a pair of openwork wings – come to life to display the time. This elegant tableau stands out against a guilloché background, whose radiating motif adds to the dial’s vitality. Several layers of translucent Grand Feu enamel are then applied to lend depth and brilliance to the ensemble. With this double retrograde movement with time on demand, the Maison once again emphasizes its poetic vision of time. On a watch with a retrograde display, the hands – instead of turning about an axis – trace an arc before returning to their initial position to begin another cycle.